The TC3 range of auto-transformer speed-controllers are of a 5-step design and vary the speed from 100% down to approximately 30% of full speed. Auto-transformers vary the voltage to the motor to vary its speed. The method is very efficient, as power consumption is reduced by as much as 95% and does not generate noise. 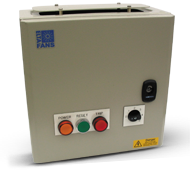 When used to control a number of fans the total full-load amps of all the connected fans must not exceed 85% of the maximum rating of the controller. The motors must be designed for speed control by voltage reduction.